I really like The Falcon as a character. I'm gonna step outside the lines here and admit that I REALLY liked Sam Wilson as Captain America and was pretty disappointed that Marvel didn't have the guts to hold the line on keeping Steve Rogers an old man passing the shield on to a worthy successor. The Falcon has always had a bit of a problem carrying a series. It's like Marvel feels like they HAVE to somehow keep him in the lane of literally being a Social Justice Warrior, and to me that's okay. . .in small doses. Eventually it breaks down because you can't have a character that only appeals to a certain way of thinking over the long term. I'm not being racist or any other kind of -ist. . .just telling the truth. Yeah, yeah. . .I know. I said Aliens vs. Predator was up next. I found out I don't actually have all 4 issues of that series. I'm missing the final issue. I have 2 copies of different covers for #1, so I saw 4 issues in the box. After Marvel backpedaled on the "Death" of Captain America and put the character through a convoluted wringer to get him back into continuity, they seemed to have a bit of a problem deciding what to do next. 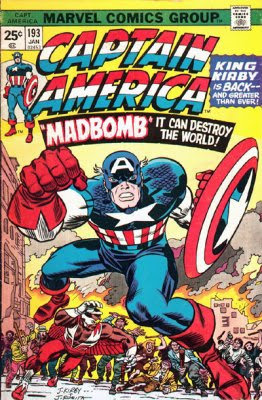 Captain America is one of my favorite (super hero) characters of all time. I'm gonna say something here that MIGHT just be a little bit disagreeable to a lot of comic book readers out there. I REALLY like Sam Wilson as Captain America, and I hope he STAYS Captain America. Longbox Junk - Invaders Now! The Invaders confused me a bit. I thought that they were an actual Golden Age team, but I was a bit surprised to find out that they were actually created in the 60's and retconned into the WWII era. I wonder if this might be one of the earliest examples of this being done. That aside, I'm also not sure why this mini was noted as a crossover between Dynamite and Marvel, maybe some licensing issues with some of the Golden Age characters?